Are your kids Rainbow Loom crazy? My oldest got a Rainbow Loom last year for Christmas and has been a bracelet making machine ever since! Once my 5 year old hit kindergarten he wanted a Rainbow Loom too. His sister let him practice on hers, but that left only one for everyone to use. Instead of sitting around doing nothing they figured out how to make bracelets without the loom and only their hands. The only supplies you need to make Rainbow Loom bracelets by hand are a bag of the little bands they sell everywhere with some C clips inside. You can purchase them at a craft or toy store for just a couple dollars. We thought the easiest way to show you how to make the bracelets by hand was with a video so here you go! If you are new to the Rainbow Loom madness and want all of the latest supplies here are some affiliates link you can check out. 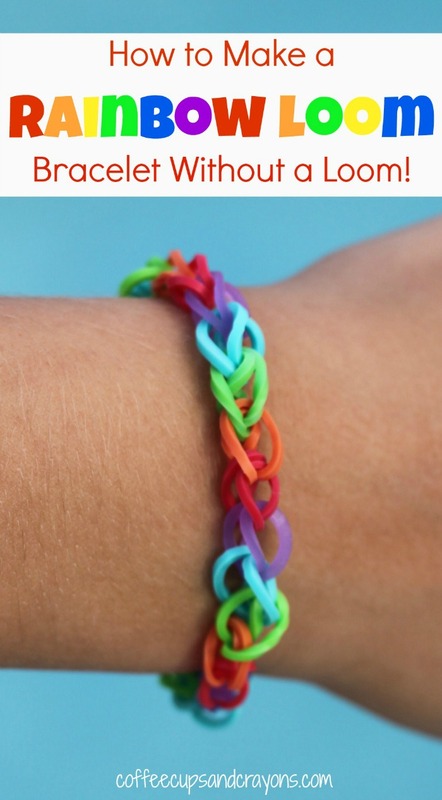 Making Rainbow Loom bracelets is a great way for kids to get crafty after school! There were some cute crafts for kids linked up to the After School linky last week too. My kids would love to make the Pom Pom Hedgehog or the Beaded Napkin Rings. If you are a blogger we would love to have you link up your after school posts for kindergartners and up–crafts, activities, playtime and any adventures that you are doing to enrich your children’s lives after their day at school, homeschool or on the weekend! Thank you, thank you, thank you! Heard the looms were available at Michael’s & Walmart, but hey, this is better! Tere Figueras if you click through to the comments on the post people have other ways to make them without the loom too! People are so creative! My daughter’s fingers started turning blue from doing Rainbow Loom on her fingers, so I came up with my own ‘loom’ a clothes pin. It’s much easier for her to have the rubber bands on something else so she can stop at anytime and it requires less coordination for a 5-year old. It makes the fishtail method so easy, even without a loom. Give it a try! That’s a great idea May!!! You could also use a fork if you want to. Love this! Your kids are very clever! The kids at school wear these all the time. I have pinned this to the Better Homes and Gardens board. You are the best Deirdre! Impressive How to video! Great, clear instructions. We don’t have a loom but I was wondering if these could be made w/o one. My son has gotten several from friends as little gifts and he thinks they are super cool. She will be so thrilled with the compliment! Thank you! Key everyone the easiest way to make a rubber band bracelet is by hand and its easy to make a fishtail just put three on yout hand but the first one twist and then all the rest are going to be normal,then you bring the bottom one over on both sides and remember there is all ways going to be three on your hand! Thanks for reading. Megan! This is awesome. We are going to try it. I have the feeling my kids will like making these by hand so I’m just going to buy the bands and clips and not the loom and give it a go. Pinned it. Your daughter did a great job with the video tutorial! My 5 year likes making them by hand better than with the loom! I think just getting the bands is a great idea! And she will be THRILLED with the compliment! Thank you!!! !